Google announced a slew of updates for its Hangouts cross-platform messaging service today, including SMS support, animated GIFs and one-tap location sharing for its Android app. The update, which will be available in the Google Play store “over the next few days”, will give you the ability to instantly share your location with fellow Hangouts users. Just tap the new pin icon in the bottom right-hand corner of the app, and Hangouts will pull in your immediate position and post it within the conversation stream as a Google Maps thumbnail. It was promised months ago, but the Android version of Hangouts is also being updated with SMS support. That means you’ll be able to use Hangouts as your default app both for traditional texting and web-based instant messaging, effectively replacing the default SMS app. In addition, animated GIFs will also play inline now. The video calling experience, meanwhile, is being revamped across all supported devices. Videos will now play full screen and Google has promised to fix and enhance webcam lighting on the desktop automatically. 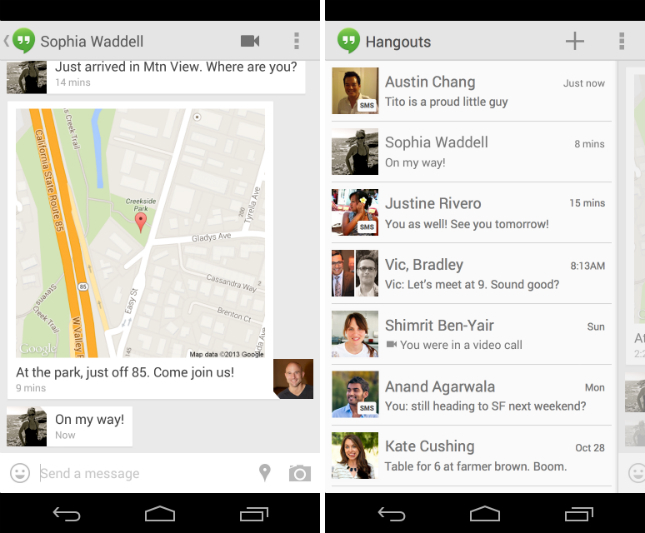 It’s unclear whether location sharing and SMS support is planned for the iOS version of Hangouts. For now though, it’s worth checking to see if you can access the latest version on your Android smartphone or tablet.